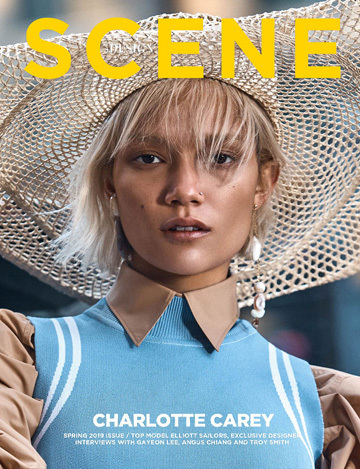 Talented fashion editor Alex van Der Steen from prestige Eric Elebaas Agency teams up with photographer Yoshioaki Sekine for this dynamic Surface magazine menswear pictorial focusing on coveted fall winter designer pieces. 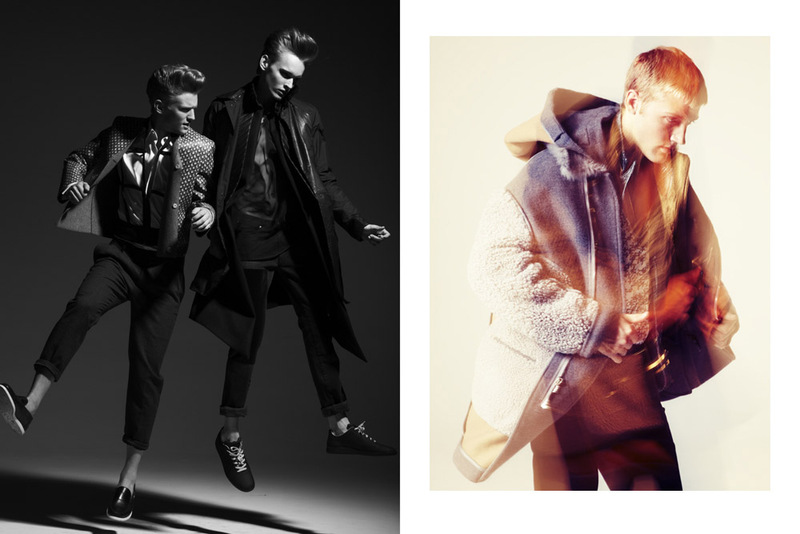 Right : Jozef Exner in Phillip Lim Coat Sheerling brown suede coat. 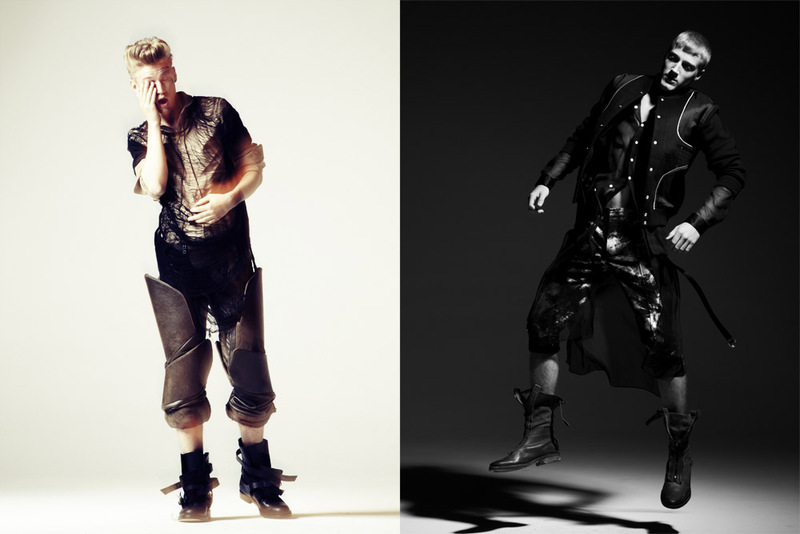 Opposite page Left to right: Jozef Exner in Triple lapel blazer by Martin Margiela Over chiffon top by Obesity and Speed,leggings with tastles by Obesity and Speed, black sweat shorts by H and M/ Middle Model:Dennis in Black brushed wool jacket , Kris van Assche checkered vest, Petrou Man silver and black tie dyed pants under sheer button down black shirt, Far Left: Model Alexander Johansson in Martin Margiela black blazer over black and white Ksubi tank with Kris Van Asche double knit black tights over blue Versace pants . Left to Right. 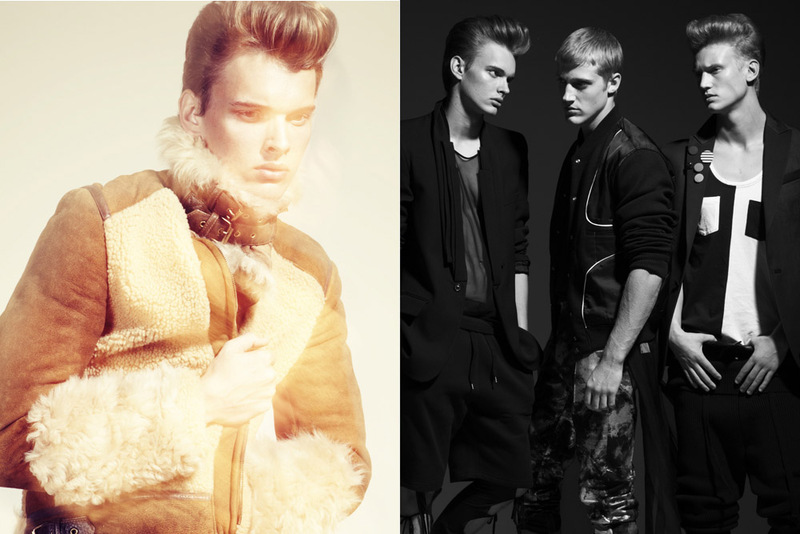 Model Jozef Exner In Louis Vuitton Jacket over white Saftey pin shirt by Petrou Man , with Python printed pnats by David Delfin Boots Versace ,Middle, Model Alex Johnson in Alexander Mcqueen suit boots by Kris Van Asche, Left model Alex Johansson in Dolce and Gabbnna Vest and tank boots by Martin Margiela, lace pants by Jermy Scott for Addidas.Black shoes white laces by Comme Des Garcon. 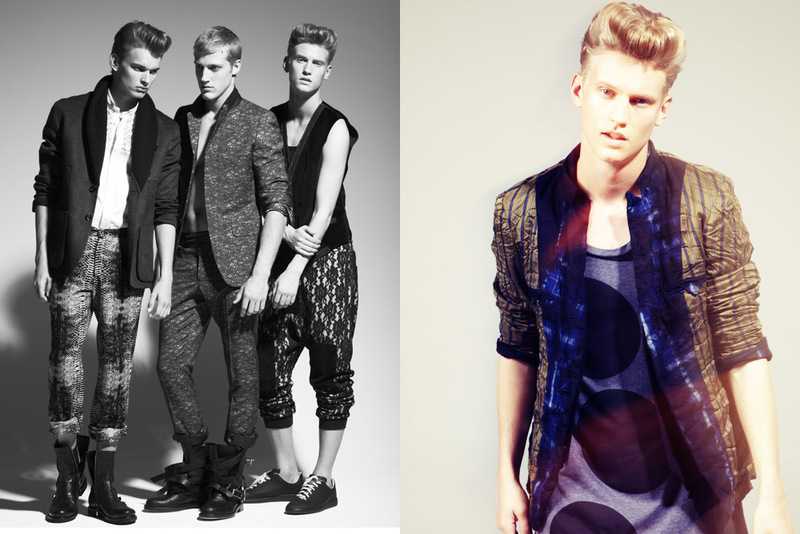 Opposite page Model Alex in Petrou Man plaid inside out blazer with XL poka- dot tank the Furies.